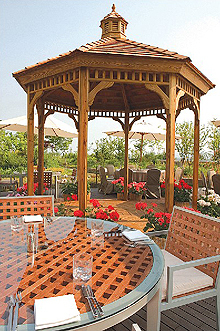 Hyatt Regency Incheon is delighted to present the Garden Barbeque, held in its beautifully designed wild flower garden located on the 2nd floor, where guests also have a magnificent view of the spectacular sunset whilst surrounded by the aromas of summer and spring. The Garden Barbeque is available from June 1 to September 16 every Friday, Saturday and Sunday; and daily from July 27 to August 15, 2007. At the Garden Barbeque, guests can enjoy an outstanding selection of prime meats, fresh seafood and vegetables, all prepared on a charcoal grill by skillful chefs. Delightful salads, pastas and mouthwatering dessert stations will be beautifully set to offer fresh, unique and tasty products as well as natural ambiance. The Garden Barbeque is priced at just KW54,000 plus 10% tax per person, and one complimentary summer cocktail is offered to all BBQ guests at Vy bar. The Terrace snack bar serves a variety of fresh salads and sandwiches, and also features a children's menu, providing a choice for every mood. The bar opens from 11:30am to 3:30pm between July 20 and August 15.